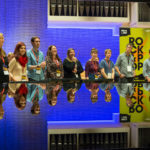 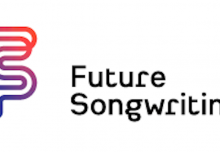 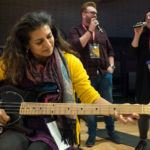 Musical Futures’ conference the Music Learning Revolution took place on Tuesday 18th October 2016 at the Royal Northern College of Music, Manchester. 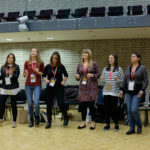 Despite the rain outside, the RNCM was lit up inside by the music and energy of the 200 attendees. 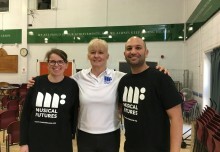 Musical Futures CEO Abigail D’Amore opened the day with an exciting announcement of a new partnership between Musical Futures and MLR gold sponsor Trinity College London, as well as the launch of Musical Futures training and resource programmes for Just Play and On Cue. 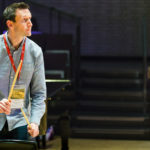 Practical music making kicked off with Adam Saunders leading all delegates in a mass ensemble performance of On Cue in the elegant surroundings of the RNCM concert hall. 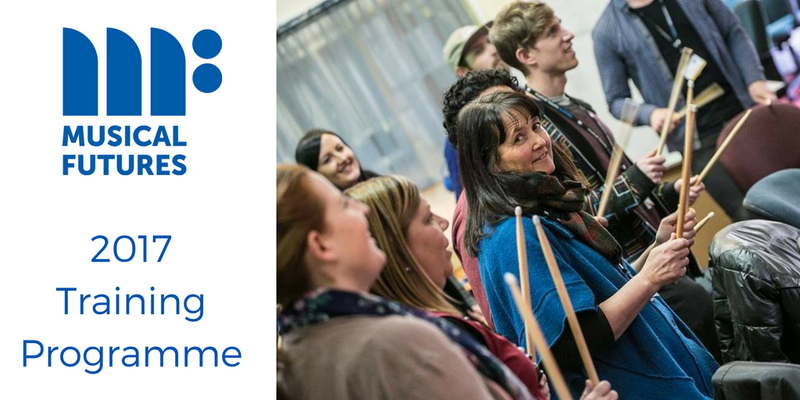 This was followed by Musical Futures workshops in Just Play, Find Your Voice and Start with a Set Work / Composing and Improvising – providing practical tasters of Musical Futures’ national training programme for teachers. 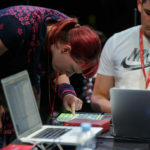 The RNCM theatre provided a technology zone, with two inspiring workshops led by sponsors Audio Active and Ableton, featuring the Electric Youth Ensemble demonstrating how to integrate technology into ensemble performance. 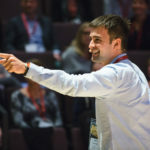 MF Champions Peter Romhany and Matt Keil led a session on using Makey Makey in the classroom, with tin foil, cardboard and a lot of found sound! 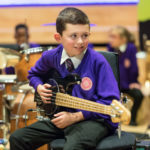 Children from St Ambrose RC Primary School in Manchester gave an inspirational performance of three songs in their whole class rock band. 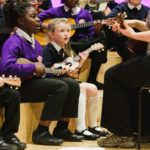 St Ambrose were one of the first primary schools – in partnership with One Education, Manchester – to trial Musical Futures’ Just Play. 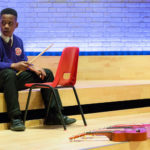 The children spoke with honesty about how important and exhilarating playing and performing together was, and how good it made them feel. 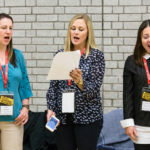 Lightning speeches, sponsored by ABRSM, provoked debate and discussion. 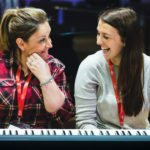 Sharon Bruton, Chief Executive of the Keys Federation Academies, talked about how music should be at the heart of a school’s learning culture (read her full speech here). 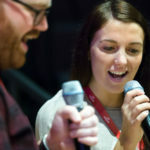 Andy Stott and Katie Chatburn from the RNCM discussed the potential danger of ‘labelling’ music into genres. 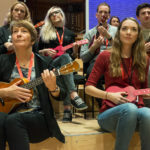 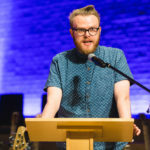 And David Howard, professor of electronical engineering at the Royal Holloway, University of London, made the point that ‘we are seriously failing our children by making them choose between arts and science’, stating that creativity is critical for engineering and music plays an important part. 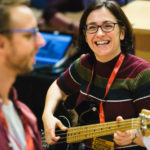 Open space sessions involved practical and discussions sessions on Orchestras Live partnership working, Drake Music’s approaches to inclusive assessment, and a demonstration of how Google Classroom works in one school. 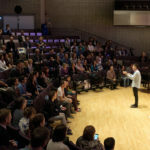 Professor Martin Fautley hosted clinics and discussions on assessment, uncovering issues and solutions with delegates. 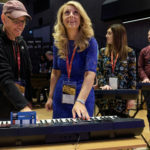 Delegates reported the exhibition space was relevant to their needs, with interactive demos and information from all exhibitors creating a buzzing foyer space. 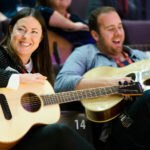 The day ended with a closing speech from Musical Futures Chair Anita Kerwin-Nye thanking teachers for their incredible work with pioneering music learning, and Adam Saunders sent everybody home singing following a whole-group sing-off. 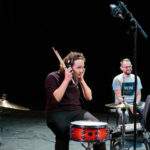 Watch the Live videos of sessions on Facebook. 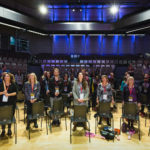 Watch the resources section of our website for material from the sessions. 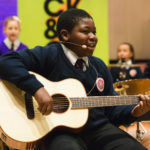 With grateful thanks to gold sponsor Trinity College London and equipment sponsor PMT Manchester for the quality instruments.